I've been looking for a decent rug for the Addition for ages now. The old rooster rug just wasn't cutting it anymore. The bare floor is cold during the winter months, and I wanted something a little larger to keep the girls warm. I was in Wal-Mart last week, and the heavens parted. Lo and behold, this lone rug sat on a rack by itself, marked down to $44.50. I made Natalie get out of the cart and walk so I could get it to the register before someone else snatched up what was clearly meant for me. There's a lot of work left to be done on this room, which is currently used as a miniature Toys 'R Us by Natalie and Michaela Byrd, but we're getting there. 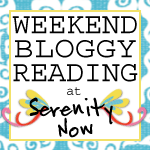 Linking up to Kimba's DIY party over at A Soft Place to Land. It just goes to show how much something simple like a cheap Wal-Mart rug can warm up a room! Make plans now to link up your current Decorating Dilemmas (anything around the house or yard that you'd like some feedback on) or best Solutions! You asked, and I conceded. In March, I'll give you a chance to showcase the progress you've made with any of the Dilemmas you've linked up in the past few months. I count pretty much anything as progress...even if it's just picking and choosing which of the suggestions you liked most and which you plan on implementing with your Dilemma. It will be fun to see the changes you've made...I know I have my work cut out for me before March gets here! The rug was a great find! I'm marking the dates on my calendar! The new rug really is much better! 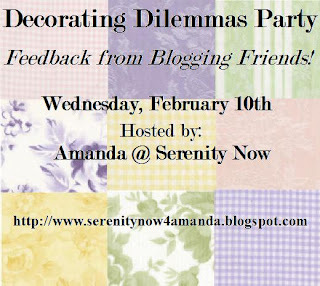 I like the idea of your dilemma parties...now to figure out which decorating issue I should bring up first. I really like your new rug. I would have snatched that up in a jiffy, too. 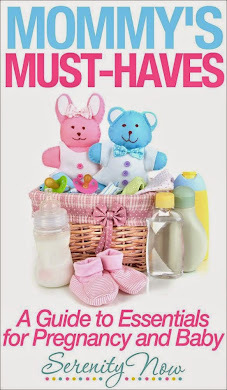 It's great that you have a playroom for a dedicated spot for all of the toys. I would never have noticed that your curtains were short if you hadn't pointed it out. Are you planning to sew a band of fabric to the bottom? That would be a cute solution. Great rug! It's a perfect place to play...! I am so excited about decorating dilemmas AND show me the progress! I can't wait! LOVE the rug. I saw the same one at our Wal-Mart this morning, but it wasn't on sale. I was looking for the one with the red border. Looking forward to more decorating dilemmas! Love the rug... and your picture wall! ;) I have a long way to go on decorating... but love to see what others are doing! The biggest torn in my side is putting pictures on my walls~! I just can't commit to any thing! anyway... nice job! Lovin' the rug! It looks like it has the texture of sisal or seagrass but softer underfoot! Looking forward to the par-tays! Nice find but I am ooooo'ing and aaah'ing over your cute Pomeranian! Love her? him? So, so cute!!! I love how small, simple changes like a rug can make a huge difference. Nice choice! ohhh good find!! I thought Target forsure because I saw one like that there but hey Walmart is just as fine girlfriend! Love it! It's the same rug I had in mind for my dining room! I love that picture of the doggy on the rug with your daughter. Nice work- the larger rug is much better, and I love the thick black border. 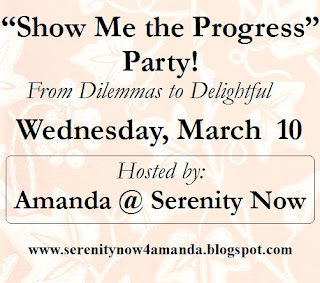 :) Can't wait to swing by your next Dilemmas party! LOVE, love, love the new rug! It goes great with the capri curtains. You know I'm kidding...sorta! I'm a hateful friend...I apologize! What a difference - it looks so pretty! It clearly was meant for you! Big improvement and what a deal! What a great find! And it looks fabulous. By the way - You should see my shorty curtains. They totally beat your shorties. That's Wal-Mart?! Wow! They are moving up in the decor world. Great find! It looks awesome! You know you could add a fun little fringey treatment to the bottom of your curtains for an EASY way to lengthen them. Love the picture wall too! And if THAT'S your UGLY, then we need to talk! I've got some serious UGLY you haven't seen yet. Hmmm, maybe I'll post on that soon! Now that's a great find! What a great price! Looks great in the space and seems durable! Great find! It's amazing how much better it looks without the toys all over too :) I just love way our family room looks when the toys are picked up. Too bad it seems like they only stay picked up for 2 seconds! What a great find! Wal-Mart has some really cheap rugs on their website too just as an FYI. I keep forgetting about the Decorating Dilemmas parties! I need to try and link up to these, they are so fun. Hmmmm...the bad looks like my house... Nice find on the rug! Great find. Love the new rug. I must say Wow...I don't feel alone anymore. I have a 3 yr old and 8 mth old that as soon as try to fix up an area in our home it's also now their fav place to play. :) too cute and funny. LOVE the rug! I'm always on the lookout for a great rug to dilute the hideousness of the gaggy pink carpet, but so far haven't found what I'm looking for! Much better! I desperatly need a new rug in here! Great find on the rug. The curtains do not look bad, but they would be so easy to sew some contrasting color material at the bottom since they already have the band at the bottom. Oh How I wish I had a play room for my little girl.EVERYTHING is in our living room.